HF: The Rhyl History Club, Wales, UK, has a report of Alfred Dickinson’s death and details about his career. He was a widely travelled man including to Hong Kong. 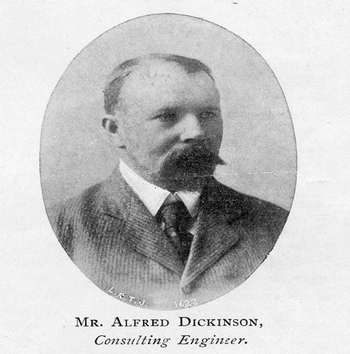 His company Alfred Dickinson & Co was closely involved in the development of Hong Kong Tramways. More information about the company in HK, its involvement in tramways here and indeed about the man himself, when he visited or lived here would be useful. The death occurred on Tuesday of Mr Alfred Dickinson J.P. M. Inst. C.E., M.I.M.E. etc., Salem Bungalow, Coast Road, Rhyl, a former well known engineer whose work took him all over the globe. Mr Dickinson, who was eighty five years of age, was a native of New England, near Peterborough, but at the age of eight was taken by his family to America where they trekked across the country in a “Prairie Schooner” for four months to reach their destination “The Golden West”. The journey was undertaken at the close of the war between the North and the South States and proved to be most hazardous and crammed full of adventure. Mr Dickinson’s parents returned sometime afterwards however, owing to the mother’s illness. Mr Dickinson was apprenticed to the Manchester, Sheffield and Lincolnshire Railway, being in the Engineers’ Office in London Road, Manchester. In 1892 he started in business on his own account as Consultant Engineer with offices in Central House, New Street, Birmingham and at Gresham house, Old Broad Street, London. His work carried him to almost every country in the world and he was responsible for the building and equipping of tramways at Barcelona, Madrid, Cape Town, Hong Kong, Singapore and Dublin, among other projects. He made numerous voyages and among countries he visited were Japan, China, India, South Africa and America. He had many patents registered in connection with various electrical undertakings and formed a company under the title “Dickinson Patents Ltd”. At one time the general manager of the South Staffordshire Tramways, he was also engaged at one period as consulting engineer to the Birmingham Corporation Tramways. He was a prominent Freemason and was a Justice of the Peace for Staffordshire. The following is culled from “Notable Londoners”: Mr Dickinson was the first engineer to construct overhead electric tramways in Great Britain. He claimed the distinction of having acted – among the many important works he had undertaken – as sole engineer to the Tatan Hydro-electric Undertaking in India, the largest enterprise of its kind ever carried out by an English engineer. Mr Dickinson was consulting engineer to the Tasmanian Government Hydro-electric Schemes and was well known as a Parliamentary and expert witness in matters appertaining to electrical undertakings. The funeral takes place on Saturday at Handsworth Old Church, Birmingham. Interment to be made in that city”. “Interment – Mr A. Dickinson, Rhyl. The funeral of Mr Alfred Dickinson, Salem Bungalow, Rhyl (whose death was reported in last week’s issue) took place on Saturday. Owing to unfortunate circumstances the burial could not take place at Handsworth Old Church Cemetery, Birmingham, as previously arranged, interment being made in the Rhyl Town Cemetery. A service was conducted at Salem Bungalow by Canon R.H. Roberts, M.A. Vicar and at St. Thomas’s Church and at the graveside”. You asked for more information about Alfred Dickinson, who was my great-great-uncle. He had a very interesting life which I have been researching for years. When he was a child his family trekked across America by covered wagon, so he had little formal education in his early years. He originally worked as a railway engineer, then moved into tramways, being responsible for the first overhead electric tramway in the UK. He built tramways all over the world, then moved into hydro-electric power generation. I recently produced a short illustrated biography which was privately printed for family members. I would be happy to send you a copy if it would be of interest. Incidentally, Alfred’s house in Rhyl was Salam Bungalow, not Salem Bungalow as printed in the obituary. Salam is the Arabic for peace. Nothing to do with witches!